The Great Forest Park Balloon Race is a St. Louis freebie that you can not miss. Your kids are gonna love this! Colorful hot air balloons take to the sky from the middle of Forest Park on Saturday Sept. 15 2018 and race after the PNC Bank’s Orange Blossom hare balloon. This is the 45rd year for the race, which really isn’t a race at all. The “hare” balloon launches first, goes where ever the wind blows it and lands in a field–which sometimes ends up being a high school football field. The hare’s job is more than just starting the race. That balloon pilot has the job of finding a safe place for all the balloons to land. After landing, the pilot will place a giant X marker out on the field and the other balloon pilots will try to hit it with a bean bag marker, then fly off to land their own balloons. The pilot who gets closest to the marker wins the race! 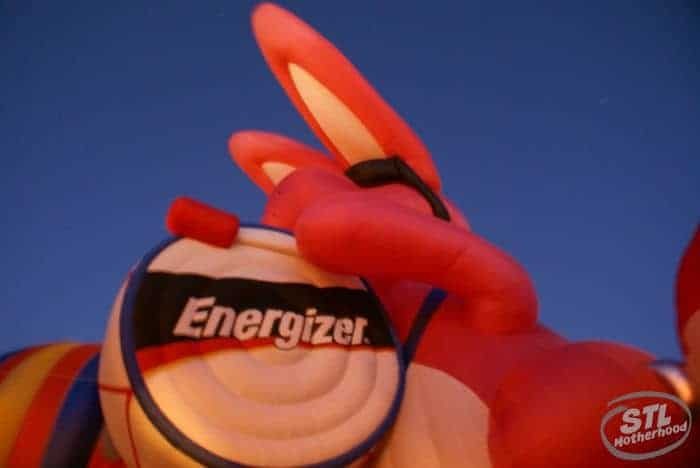 For years the hare balloon was the massive Energizer Bunny, but it the bunny has been retired. I’m not sure if the balloon just got old, but there were several times when the bunny couldn’t perform it’s duty due to wind conditions. The bunny balloon was about 15 feet taller than the Statue of Liberty–that’s pretty freakin’ big. Race day has a carnival feel to it! Vendors sell every kind of festival food, from funnel cakes to meat on a stick. There’s beer for the grown ups and ice cream for the kiddos. 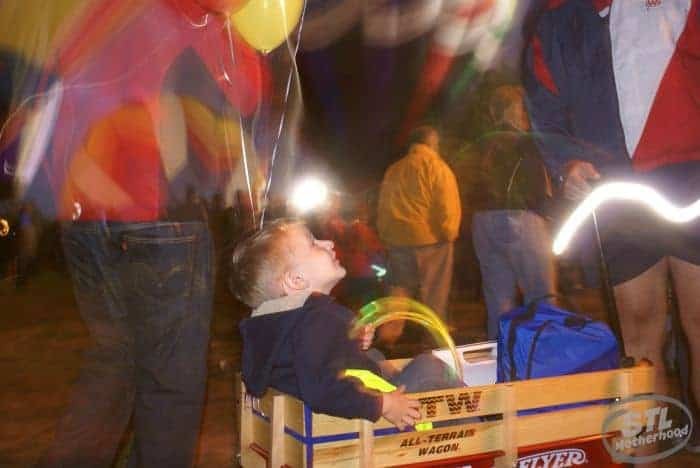 The festival starts at noon, but the balloons don’t launch until 4:30pm, so you can while away the time with live music, games, bounce houses and pony rides. There’s also tons of booths from community groups and businesses who hand out freebies, so you can wander around collecting goodies. Then there’s a photo contest at 2pm–they inflate a few balloons for a photo op–and sky divers at 3pm. But I really love the Balloon Glow on Friday night! Some years we can’t make it to the race, or it’s just too hot. So we started doing the balloon glow on Friday instead. You still get the whole carnival atmosphere: beer, funnel cakes and games for the kiddos. But rather than waiting around to see the balloons launch and vanish, you get ALL OF THEM inflating at once and sticking around for the whole night. The Balloon Glow starts at 7pm and ends with fireworks at 9:30pm. You’ll want to come a little early, because it’s pretty popular too. In my opinion, the Balloon Glow is even better than the race because you get to walk around the balloons. The Glow is all about getting up close and personal. You can wander around with the balloons right over head and talk to the crews. We always bring a picnic dinner and lately, our dog. We eat while we’re waiting for the fun to start, then we pack everything up and wander around the balloons. In years past we stuffed everything into a stroller, but as the kids grew up we pared down to the basics in a backpack. Come early to find a parking space and stake out a good viewing spot. This year the balloon race will be held at Art Hill. You can check out the balloon race’s page on parking here to see road closures. And here’s a great interactive map of Forest Park if you want to see where the parking lots are located. There’s also plenty of street parking! Bring chairs or a picnic blanket. You’re going to be here a while. If you decide to establish a base camp, you might need to leave one parent at your picnic site to keep an eye on the chairs. If you’re doing the glow, you may want to pack lighter and take just a picnic blanket. (This frees everyone up to wander around the balloons.) On Race Day you can stay in one spot to watch the launch. Bring a cooler and snacks or an entire picnic meal. You’ll see people bringing everything from fried chicken to wine and cheese. Carnival style food is available (think meat on a stick) but at carnival prices. Budget savvy moms will pack drinks and snacks and save their money for a special treat (think funnel cake). If you have a toddler who doesn’t really need a stroller, bring it anyway to haul your gear. Wagons are also good if you don’t mind dragging them around. Forest Park also allows you to bring in your own adult beverages, hint hint. Pack your own souvenirs. Here’s a sneaky tip to keep the kids from spending all your money. Bring your own “souvenirs.” This is especially true for the glow when there will be vendors selling all manners of blinky and glowing toys. A quick trip to the dollar store will bag you cheap trinkets like glow sticks and punching balloons. Bring a flashlight to the Glow. By the end of the Glow it gets pretty dark and you might want the extra light to pick your way back to car, especially if you take any shortcuts away from the sidewalks. Keep an eye out for freebies. Many of the booths have promotional items to hand out to the kids! We’ve picked up balloons, pens, glow in the dark cups and stress balls at previous balloon glows. For more details and a schedule for the Great Forest Park Balloon Race (and Glow!) check out their website here.